Former Las Vegas Sands Corp president Bill Weidner has been chosen to operate a new US$3.5 billion (28 billion patacas) gaming resort in The Bahamas. Baha Mar is being majority-funded by the Export-Import Bank of China–a state-owned Chinese institution–and is due to open in December 2014. Former Las Vegas Sands Corp president Bill Weidner has been chosen to operate a new US$3.5 billion (28 billion patacas) gaming resort in The Bahamas. 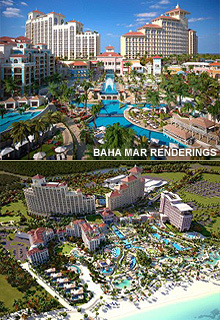 Baha Mar is being majority-funded by the Export-Import Bank of China – a state-owned Chinese institution – and is due to open in December 2014. Another equity partner, with US$1 billion, is Sarkis Izmirlian, chief executive of Baha Mar Ltd. The resort will be managed by Mr Weidner’s Global Gaming Asset Management LLC, which has an equity stake in the US$1.2 billion Solaire Resort & Casino in the Philippines, and is pursuing a gaming resort licence in Matsu in Taiwan. Mr Weidner, who helped develop The Venetian Macao while at LVS, told Business Daily that an equity stake in Baha Mar wasn’t an option as the project was already advanced when GGAM was asked to get involved. The project has been in preparation for ten years, but an original proposed equity partner – Harrah’s, now Caesars Entertainment – was unable to go forward with the scheme, sources familiar with the situation told Business Daily. The beach-front project will have a 100,000-square-foot casino with 150 gaming tables and 1,500 slot machines as well as luxury hotels, dining and shopping, a golf course and a convention centre. The executive added the resort also has permission to offer ‘in play’ betting on live sport, and also proxy telephone betting and online betting. It will be the second gaming resort in the Bahamas. The first, called Atlantis, was developed by South African gaming entrepreneur Sol Kerzner from 1994 onwards, from an earlier investor’s project. To commemorate the 40th year of independence of The Bahamas, ZNS Network has released a series of videos of footage taken during the ceremony July 9, 1973. Watch the second installment here. Inter-American Development Bank senior specialist Wayne Beecher has urged Bahamians to invest in low carbon, environment friendly technology. Watch an interview with Beecher here.